"Our vision is to enable the sustainability of many-core scaling by preventing the uncontrolled increase in energy consumption and unreliability through a step change in holistic design methods and cross-layer system optimisation." 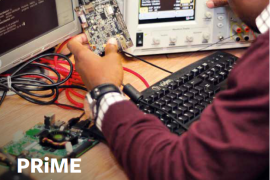 PRiME, is a five year £5.6m EPSRC funded research programme (2013-2018), which brings together four UK universities with world-leading expertise in low power, highly-parallel, reconfigurable and dependable computing and verified software design. Working in collaboration with five companies and seven international visiting experts, PRiME is addressing the challenge of power consumption and reliability of future high-performance embedded systems utilising many-core processors. K. Murray, A. Suardi, V. Betz and G. Constantinides. Calculated Risks: Quantifying Timing Error Probability with Extended Static Timing Analysis. IEEE Transactions on Computer-Aided Design of Integrated Circuits and Systems. Mauricio D. Gutierrez, Vasileios Tenentes, Tom J. Kazmierski, Daniele Rossi. Low cost error monitoring for improved maintainability of IoT applications. 2017 IEEE International Symposium on Defect and Fault Tolerance in VLSI and Nanotechnology Systems (DFT). Basireddy, Karunakar Reddy, Singh, Amit, Merrett, Geoff and Al-Hashimi, Bashir. Online concurrent workload classification for multi-core energy management. accepted for publication in ACM/IEEE Design Automation and Test in Europe (DATE), Dresden, Germany.